In the Etymological Venn Diagram of Baseball Team Names, the Twins are identified with "geography"
Per Stensation, Slate.com has a fun look at Craig Robinson's new book, "Flip Flop Fly Ball." 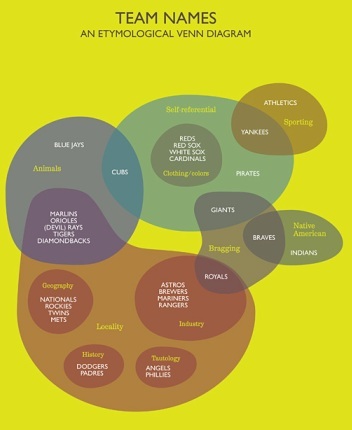 The book is a series of baseball-related graphics that appear to nicely blend information and whimsy. Our favorite of the four Slate published is the one you see below; check the site, though, for the others. Wednesday (Cuddyer's big gambles) edition: Wha' Happened?